Republican U.S. House Rep. Tom Emmer got an earful about the partial federal government shutdown Tuesday, at his first town-hall-style meeting he's held in his district since the funding interruption began in December. "Literally what you have right now is you have an executive who has demanded $5.7 billion, you have a majority leader in the Senate who has offered $1.6 billion at different times. 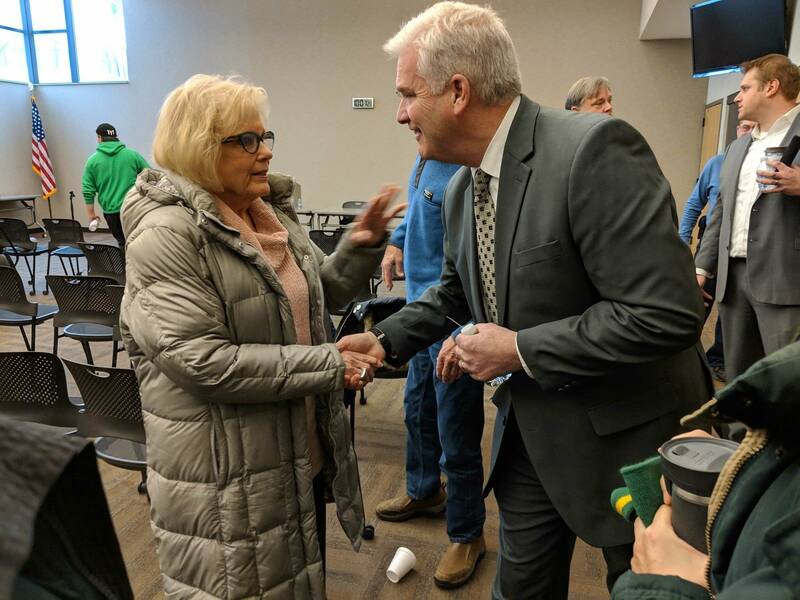 And you have a new speaker of the house that has offered $1," Emmer told about 60 people gathered in a conference room at Ramsey Municipal Center in northern Anoka County. The crowd for the 9 a.m. gathering was mostly skeptical about the shutdown. A few in the crowd challenged Emmer forcefully on the issue, although others said they had very real concerns about border security. Emmer didn't offer any new insight on the 32-day impasse, although he noted he had to change the meeting time to accommodate a return to Washington Tuesday. "We're going back today and I'm hoping that's because reasonable people are going to prevail and there's going to be some compromise between these numbers. There is movement. They're trying to get people to the table," Emmer said. But many in the crowd were skeptical, and a few even audibly derisive. 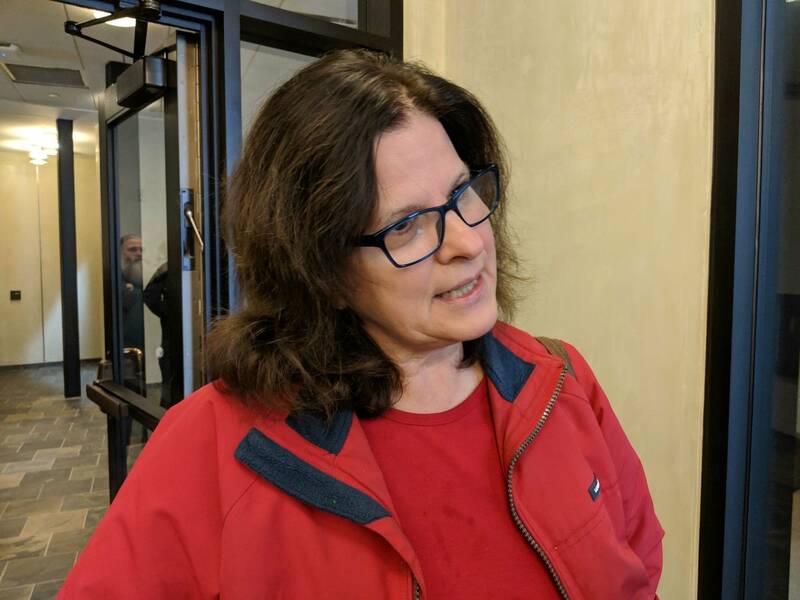 Janine Smullen of Big Lake told Emmer her husband, a chief inspector for the Federal Railroad Administration, has had to continue to work without pay. "It's incredibly stressful," said Smullen, who said she was picking up extra shifts as an emergency room nurse in Princeton. "There are people who are really suffering because of this shutdown. It's not just a number. And I don't understand. I don't get the point. If they're going to pay us why make us suffer? So the only point is to make people suffer until I get my way? It just doesn't make any sense, at all," she said, after telling Emmer of her family's situation. Most expressed a similar sentiment, although there were some in the crowd who said better border security needed to be a top priority. Carol Polzin, a retired executive from Big Lake, told Emmer she was concerned about drugs, human trafficking and crime coming in through the U.S.-Mexico. "I was just so glad that we have a president who has the courage to stand alone a lot of times and do his constitutional duty and protect our friends and family and children and everybody from all the incoming abuses of our border security," Polzin said. Emmer was repeatedly questioned about the partisan divide in Washington, expressing concern about its intransigence and asking if Emmer would be willing to oppose other Republicans in Congress and wondering how a compromise might be reached on a budget deal. Emmer talked about what he saw to be the biggest obstacles to that, including the narrow margin of victory for Democratic House Speaker Nancy Pelosi that left her little negotiating space with the other members of her conference. The third-term Republican may have something to do with that margin. He was just elected chair of the National Republican Congressional Committee, the campaign wing of the GOP House caucus. He's leading the effort to recruit and elect Republicans across the country — work he described outside the meeting as going "much better than expected. We have people coming to us." 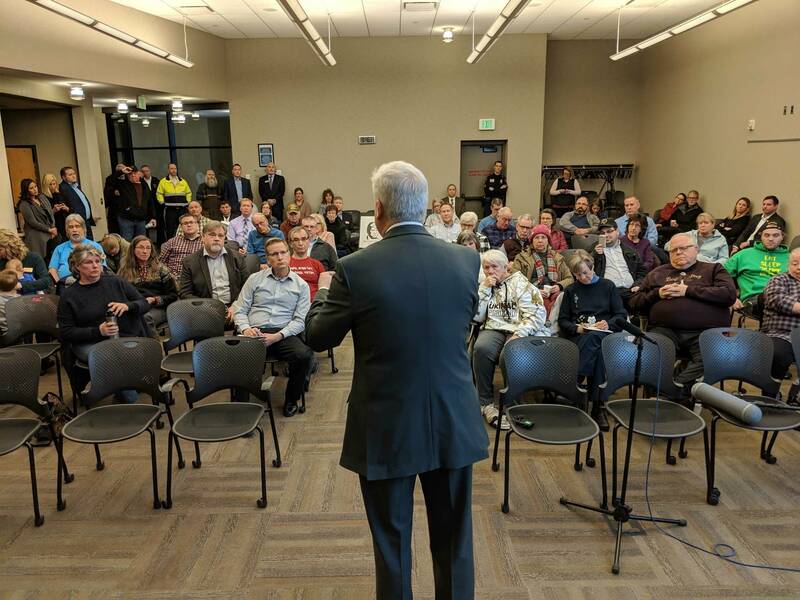 Talking to constituents, Emmer also said rhetoric about border security, and repeated reference to a wall was also hardening political positions in Washington. He refrained from mentioning President Trump by name, referring to him repeatedly as "this executive." Emmer added he believed the debate was nonetheless a discussion worth having, and he believes federal border security officials that have pushed to build at least something along the border with Mexico. "I'm not going to restrict (the Department of) Homeland Security. If they say that this area needs a physical barrier, then we'll have resources where you can have a physical barrier here. If they say we just need roads, we need technology in this area — that's why it's more than just a physical barrier. It's border security," Emmer said.